The fine people at the Singing in the Reign blog have an interesting and somewhat provocative post about a dirty little secret in Biblical scholarship. The secret is that many scholars, instead of actually examining primary texts like the DSS, tend to rely on reading each others works. This is a nice reminder that you should always consult the footnotes in any piece of scholarship that you read. It is good to know whether a particular assertion by an author is coming from his own reading of a text or from another scholar. This post is further proof that I need to firm up my understanding of Biblical Greek. Ideally, my desire is to take one of those summer intensive Greek courses in the near future. Although at this point, it may be a couple years before I can do it. So, until that time comes, perhaps I should try to firm up my understanding of Greek on my own. I know of a number of people who have done this, many of them later became professors of Scripture at the local seminary. And now with STB course work complete, I have the time to begin this process. Any recommendations as to a book/workbook on learning Biblical Greek? I told you, Tim, I can tutor you! If you're able to help me with, say, gas and coffee money, we could get together once a week or so for a couple of hours at a time. If you would learn the language thoroughly and for its own sake, the best grammars I can think of are N. Clayton Croy's A Primer of Biblical Greek and especially Eric G. Jay's New Testament Greek: An Introductory Grammar (though this latter one is regrettably out of print). Thanks! I do remember you saying that in a previous post. Since we live so close to each other, lets meet up at a local coffee establishment. What times are generally good for you? Well, I, for one, disagree with Michael Barber. I believe you have misread Barber's essay, Tim -- Barber does not claim it is sufficient to verify citations from original sources, he is claiming that mastery of original sources is necessary to enter the conversation. 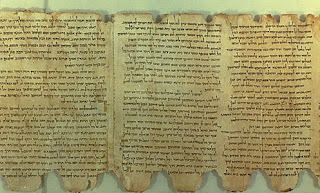 I think anyone publishing works on New Testament studies should have at least read through all of the published Dead Sea Scrolls, and the the [sic] pseudepigraphal writings. Well, leaving aside that there is no definitive list of pseudepigraphal writings (and that mastery of them requires knowledge of Hebrew, Greek, Aramaic, Coptic, Old Latin, Gothic, Armenian, Slavonic, Georgian, Syraic, and Arabic), why should the list end there? Shouldn't everyone publishing on the New Testament be familiar with Mishnah, Gemara (both the Babylonian and Jerusalem), and Tosefta? Shouldn't one have read the entire corpus of writings of the Church Fathers and Doctors? Can we not conservatively say that the list of readings is so great that no one lifetime can encompass the minimum reading list? This is an error that many graduate students make -- they believe they must master the entire literature before they begin to write a word. Needless to say one will be a very old man (or woman) before one writes a first journal article under that criteria. I have a copy of the Blackfriar's Summa. It is a magnificent work in English and Latin -- and has enabled to me get close to Thomas' thought. It is also 60 volumes long. Should I require that all those who wish to discuss philosophy with me have mastered all 60 of those volumes? While being scholarly and knowledgeable are certainly desirable traits, the nature of scholarly discourse (open debate and discussion) naturally ensures that ultimately all relevant sources will come to fore. One does not need to have mastered a minimum reading list to join the discussion. Rather, one needs to bring to the table an open mind, a sense of wonder, and natural creativity. And if you are guided by secondary sources (and what is the nature of the teachings of the magisterium if not a masterful collection of secondary sources?) to more quickly alight on the correct answer, then I cheer your wise use of time and taste. There is a special circle of hell reserved for those bloggers (ref. Canto 11 Dante's Inferno). I certainly take what you have said seriously. However, I would just add that I believe for many of us who don't have command of a particular speciality or language, that close examination of footnotes in scholarly work is essential. I guess that was my main point. I don't believe we can simply rely on the anaylsis made by someone in a scholarly work, without checking out their sources, albeit primariy or secondary. As for Biblical scholars needing to have read everything about the Church Fathers, pseudepigraphal writings, etc..... I would just say that I would certainly not expect any particular scholar to have mastered that material, but they should be at least aware and familiar with them. I would certainly expect a Patristics scholar to have read most of the works of the Patristic age, or at least most of them in the era he/she is studying, as well as have a firm grasp of Scripture and ancient history. O NRSV with Cross-References Where Art Thou?